The Priory Church of St Mary and the Holy Cross is so named because the priory was dedicated to St Mary, and the church to the Holy Cross. What remains is the nave of the priory church, which was originally a cruciform building with a central crossing tower. As a Benedictine foundation the nave has always been used as the village church, as is shown by the presence of the font, which would not be needed by a monastic congregation. The present east end was formed by extending the original pulpitum, a low wall which divided the lay area from the monastic area. The church is built of local flint and Barnack limestone. The stone was brought from Northamptonshire by river and sea in barges, and up the river Stiffkey Most medieval churches looked very different from how they appear today. They were usually covered, both inside and out, with lime-washed plaster. Traces of this can still be seen on the west front, and the interior may have been decorated. 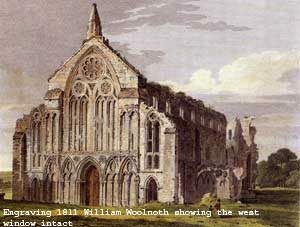 The west front is not the earliest part of the priory but is seen first and is of great architectural interest. According to Matthew Paris, the thirteenth century monk and chronicler, this facade was built between 1226 and 1244 when Richard de Parco was prior. The facade is divided into three parts, the centre part containing the large west window. This window could be the earliest example of bar tracery in England, in which the design is made up of slender shafts and shaped stones continuing and branching out from the mullions to form a decorative pattern. It was first used at Rheims in 1211, and at Westminster Abbey some time after 1245. Before this date, the space between lancets placed together, was pierced with an open pattern, cut directly through the masonry — known as 'plate tracery'.The window must have been magnificent before it fell into disrepair and was bricked up in 1809. Below the window is the Early English arcaded screen, with much dog-tooth ornament, in the centre of which is the main portal. This doorway is flanked on each side by five shafts, topped by crocket capitals beautifully carved from a single stone — each a masterpiece. 'they have one bell, of the weight of eight hundred pounds or under, purchased at the cost and charge of the said tenants and parishioners, to hang in the further-most western part of the said parish church, that is to say above the roof of the church next the gable, and without any detriment to or lessening of the walls or windows of the said church, to warn and call the said parishioners to divine service, so that they may hear it and be present'. The north and south walls correspond with the former aisles which were pulled down. The south aisle disappeared soon after the dissolution of the monasteries but the north aisle survived until 1809.The windows in the north aisle are the original windows, re-set.